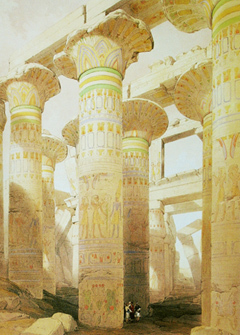 The Pillars at Karnak from a 19th century painting by David Roberts. The Great Nile River of Egypt, with its abundance of fresh water supply in the midst of the largest desert of the world has always served as a beacon of life, prosperity and civilization. The Nile River Valley was the cradle of one of the oldest, and for many millennia, the most advanced civilization on Earth. Every year without fail, the Nile would overflow it's banks, providing a natural irrigation system for the adjacent farmland and creating the crop surpluses needed for the development of a non food producing elite, and the warriors, artists, and officials needed for the development of civilization. Outside of the fertile valley of the Nile, Egypt is almost entirely a desert, which meant that once people settled there, it was almost impossible for them to leave. This factor served to strengthen the power of a central state by making it easier to raise taxes, levy armies, and enforce laws. The Nile also encouraged trade and communication between settlements by easing the flow of people and goods via riverine transport. It was therefore not surprising that Egypt would develop one of the world's oldest state societies. Ancient Egypt was divided into 2 distinct regions: Upper Egypt and Lower Egypt. The terminology "Upper" and "Lower" derives from the flow of the Nile from the south northwards to the Mediterranean Sea, so Upper Egypt lies to the south of Lower Egypt. (See Map 1) The first documented unification of Upper and Lower Egypt into a single Kingdom is recorded on the Narmer Palette dated to about 3100 BC. The artifact depicts King Narmer defeating his enemies and wearing the traditional crowns of both Upper and Lower Egypt. From this point on, the Pharoahs (Kings) who ruled over the Nile Valley during Egypt's most prosperous times (the Old Kingdom, the Middle Kingdom, and the New Kingdom) were known as the rulers of the 'Two Kingdoms' , and wore the pschent, a double crown, each half representing sovereignty of one of the kingdoms. Nevertheless, whenever Egypt went through darker, less prosperous times (known as the "intermediate" periods), there was a tendency towards fractionalization into 2 or more separate states . The Old Kingdom was Egypt's first "Golden Age". It lasted from 2686 BC – 2181 BC and was the period of the most prolific pyramid construction. Most of the Pyramids were constructed in Lower Egypt, near the Old Kingdom capital at Memphis. (See Map 2) It was also the period where Egyptian art, culture, religion and society developed it's unique flavor that would remain intact throughout the ancient period. To legitimize their rule, the rulers of Egypt promoted the idea that they were living Gods. Thus the Pharaoh was supposedly the son of the sun God Ra, and was the living embodiment of Horus (the God of the Sky), and would transform into Osiris (God of the afterlife) after his death. The notion may seem silly to us today, but there is overwhelming evidence that the common people of Egypt believed these ideas. So that when foreign rulers came to conquer Egypt, if they did not also proclaim themselves as Egyptian Gods, they would be hated by the local populace. The promotion of a divine ruler was a stabilizing force, and would be copied and adapted outside of Egypt, throughout history, again and again. The Old Kingdom of Egypt came to an end during the First Intermediate Period, where once again Egypt became divided into Upper and Lower Egypt. In Lower Egypt the 7th and 8th dynasties ruled from Memphis, they were then superseded by the 9th and 10th Dynasties who ruled Lower Egypt from Heracleopolis. Meanwhile, Upper Egypt was ruled from the city of Thebes by the 11th Dynasty. (See Map 3). Depiction of a Nubian (left), an Assyrian (middle), and an Egyptian (right) from the Tomb of Pharaoh Seti I.
Depiction of Queen Nefertiti, wife of Akhenaten with 2 of the daughters of Akhenaten. Perhaps the most renowned Pharaoh of the New Kingdom was Akhenaton. He abandoned the traditional Egyptian religion and promoted the worship of a single God known as the Aten (the Sun Disk). 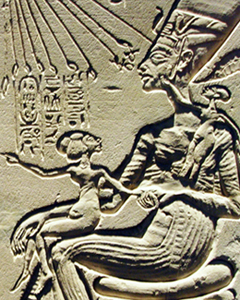 In his poem "Great Hymn to the Aten", Akhenaten praises Aten as the creator, and giver of life. Some scholars have speculated that Psalm 104 of the Hebrew Bible may have been influenced by this hymn. Akhenaton built a brand new capital city called "Akhetaton" dedicated to his new religion. 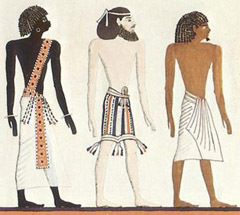 He also instigated new artistic styles in which the Pharaoh and his family were displayed with exaggerated features such as elongated heads, fingers and toes and bulging bellies, giving them an almost alien like appearance. The aim may have been to display the royal family as distinct from the common people as possible. Akhenaten elevated his famous wife, Nefertiti, to that of co-regent, and Akhenaten and Nefertiti are often displayed in artwork together, side by side with their hands outstretched to the rays of life given by their new solar God: the Aten. Akhenaten's new religion did not survive for long after his death. His successors reinstated the traditional polytheistic religions, abandoned his new capital city and even attempted to destroy most of the artwork and even the record of Akhenaten as a Pharaoh. Nevertheless, the idea that Akhenaten's new religion may have been part of the inspiration for the development of other monotheistic religions such as Judaism has been considered at length by many scholars. Whilst Akhenaten had focused his attention on domestic affairs, promoting his new religion, the Hittites had gradually extended their influence and taken control of much of Syria. The Pharaoh Ramessess II (r. 1279–1213 BC) took it upon himself to reconquer these lands and restore the Egyptian New Kingdom to the territorial control it had exercised during the time of Thutmose III. Ramessess II invaded Syria and faced the Hittite army at the Battle of Kadesh. The battle was a stalemate, nevertheless back in Egypt Ramessess decorated his monuments with reliefs and inscriptions describing the battle as a major victory. The Kushite Pharaohs were driven out of Egypt when the Assyrians invaded in the 7th Century BC. Then Egypt went through successive foreign conquests, the Assyrians were followed by the Persians, the Macedonian Greeks, the Romans, and the Arabs. But for most of this period of successive foreign occupation, Egyptian culture and religion remained intact, the Egyptian people continued to worship their local gods and use their local language. The end of the Egyptian religion came with the Rise of Christianity during the Roman period. Successive Christian Roman Emperors passed ordinances attempting to outlaw the Egyptian religion and forcibly close down the native Egyptian temples. The last remaining native Egyptian temple was the temple of the Goddess Isis at Philae, it was closed down on the orders of the Emperor Justinian in the 6th Century AD, thus ending the last remnants of over 3 ½ thousand years of Egyptian religious traditions.